Fox Labs manufactures the hottest and the best pepper spray anywhere. Its designed with the most advantageous combination of features to hit your target and make them stop their advances more quickly. The screaming hot 5.3 Million Scoville Heat Units (SHU) uses the purest and most refined resins (no junk) to deliver the heat and nothing else to your target. It acts more quickly, and devastates your attacker without doing any permanent damage. Spray distance is 10 to 12 feet for the fog and 12 to 15 feet for the stream. Fox Labs pepper sprays come in convenient 2 and 3 oz sizes, with your choice of spray pattern (Cone Fog and Stream) to fit your needs. Fox Labs warranties their aerosol pepper spray product for a full 3 years from the manufacture date stamped on the can or 2 years from your purchase or whichever is longer. If it fails to spray(very rare) we will replace it within that time frame. 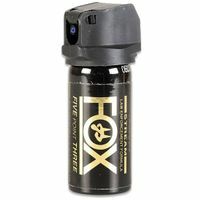 We cannot ship Fox pepper spray to NY, MA, HI, AK or APO addresses. Choose the Size, Top and Spray pattern below. Pepper spray is an aerosol and is shipped by ground service only, orders choosing other shipping options will be changed to ground.